Game-Changing Technology lets you Swap Entire Light Fittings Faster than Changing a Light Bulb! Snap Lighting is a new innovation that lets you change entire light fittings in just 5 seconds, safely, without tools, and without electricians. We all know lighting is not only functional, it’s essential for setting the style and mood of a room, but it’s one of the hardest and most expensive things to change. Melbourne based founder and inventor Adam Cusick is changing all that with the launch of Snap Lighting. The system includes recessed sockets and a range of compatible fittings for down lights, pendants, spotlights and more. The sockets need a simple one-time installation by an electrician or handyman, then fittings simply push in and push out with just one hand. Once installed you can change your lights to the latest styles whenever you like, safely, without tools or electricians. It’s a revolutionary new idea, and people are already getting excited about it! Founder Adam Cusick came up with the idea for Snap Lighting after he and his wife Rebecca renovated. “After a while we didn’t like some of our new light fittings, so we had to get an electrician to change them, which was a hassle and wasn’t in our budget. As an engineer and industrial designer, I knew there had to be a better way,” inventor and founder Adam Cusick said. Since the initial light bulb moment Cusick has developed the idea from early sketches through to patented prototypes tested to international safety standards by testing service TUV Rheinland. He has manufacturers ready to start the tooling process and suppliers ready act on short notice. Snap Lighting is already attracting high interest from renovators, builders, interior designers, decorators, homeowners and renters. Snap Lighting launched a few weeks ago on Kickstarter where people can support the project by pre-purchasing at discounted prices. The campaign runs until October 4th 2018. After the Kickstarter campaign, Snap Lighting will be available in Australia mid 2019 through the Snap Lighting online store, and retail stockists. There are plans to expand internationally in 2021. Renovating… everyone’s talking about it. You turn on the TV and there’s a show about it on every channel. You scroll through your Instagram feed and yep, everyone is renovating! So how do people find the time, the inspiration and most importantly the money to start the process of renovating their home? I’m going to share my top tips for succeeding with your renovation and how to do it within your budget, which is 100% the hardest part of renovating. Having renovated several houses, some a quick face lift and some literally starting from scratch again, I have learnt many things and finding ways to save money has been the most beneficial. Renovating can be an expensive exercise - but with some guidance and helpful knowledge it doesn’t have to break the bank. NAB have a super helpful online resource called the Life Moments Hub which is literally a source for finding your way through life’s unpredictable moments - just because life is unpredictable, your finances don’t have to be. You’re probably thinking, ‘easy for her to say when her partner is a builder’ and yes, that has meant that we have been able to do incredible things and some things that others couldn’t on the same budget but that doesn’t mean you that you still can’t do a lot of it yourselves. There are some incredible resources for learning skills to aid you in tackling your renovation in a DIY fashion. Use blogs, google, YouTube, the staff at Bunnings, your father in law, or your chippie friend, to gather as much knowledge as possible. And you will be surprised at how much knowledge and skill your friends and family have, so ask around and even ask for a day’s help here and there… your mates will love helping in exchange for a slab! If you love it, don’t buy it…just yet! It’s so easy to fall into the trap of buying things on the spot because you love it…. ALWAYS shop around, as in most cases you will find that exact item somewhere else for a cheaper price. This is especially the case for interior fittings and fixtures - the main items to always shop around for are: carpet, tiles, floor coverings, light fittings and tap ware. The most important aspect of any renovation is to be prepared with as much knowledge as possible. This is true for every single part of the renovation journey - what are you planning to do? How are you going to do it? What trades will you need? Do you need council approval? do you need plans and permits? and how long do you estimate it will take? Make a plan, plan a timeline, a schedule and LISTS before you start. Always get at least three quotes for everything, especially trades and you will be amazed at the savings you can make. Depending on the extent of the renovation you plan to undertake try to be as prepared as possible. When you have trades coming to quote, try and have your plans mapped out as clearly as possible to ensure that you’re using everyone’s time efficiently. If you know your plumber is coming, ensure you have all your tap ware on site as neither of you want them coming back another day to finish the job because you couldn’t decide on black or chrome. This saying applies for all sorts of things across your renovation! For example, if you are renovating your bathroom, do you really need 3 or 4 different tiles for the space? NO. This not only costs you more money in purchasing costs, it also costs a fortune more in tiling costs, mitering the edges of those bevelled edge, handmade, hexagon tiles you saw on Instagram means HOURS more work for your tiler, equating to an expensive bill! Before you go out shopping, know your style, pick your colour palette and don’t go over your budget. 7 - Do you really need it? This tip is following on from the above, just because someone else has it, does it mean that you really need it? So often we see beautiful images online and want that for ourselves, but if you’re renovating on a budget sometimes it’s necessary to go without, but that doesn’t mean you have to compromise on style, aesthetic or quality. Know your style and stick with it - you can’t go wrong. For example, a huge saving can be made in your bathroom by removing ‘the double basin’ - how often are two people both needing to use the basin at the exact same time? One basin means one set of tap ware, one basin, one mirror and a considerably cheaper plumbing bill. 8 - What can you live without for now? If you’re nearing the end of your renovation and money is getting tight, try to only spend on the necessities and the less important things can wait until your budget is a little healthier. A few examples of ways to finish your reno without anyone else knowing it’s not 100% complete. Pendants can wait, get all your main lighting such as downlights in and bring the electrician back in a few months to fit off your pendants when you have saved enough to purchase them. Hold off on luxuries such as sheer curtains if you also have blinds. You can have the blinds installed for now and wait a little for the sheers. New furniture - you can probably live with your old furniture in your new house for a little while. I know it’s not ideal when you want to be surrounded by stunning items in the home you have slaved over, but if it’s choosing between landscaping your garden over a new couch, I would always choose having a gorgeous garden first! Colour is one of the easiest ways to create a separation in a space without physically closing it off. The Cohabitate palette from The Colour Library Volume 11 by Haymes Paint is all about using colour to create spaces that foster conversation and togetherness, while still allowing a space to have multiple breakout areas that can serve a multipurpose. Suppliers Aura Home, Canvas + Sasson, Clickon Furniture, Cone 11 Ceramics, Country Road, CULTIVER, Designstuff, Domo, Halcyon Lake, House of Orange, Hunting for George, Ikea, Into the Wild, Lightly, Mud Australia, Open Room, Something Beginning With, Southwood Home, Space to Create, St Albans and Voyager. Top Tips for incorporating colour into your space with Wallpaper! 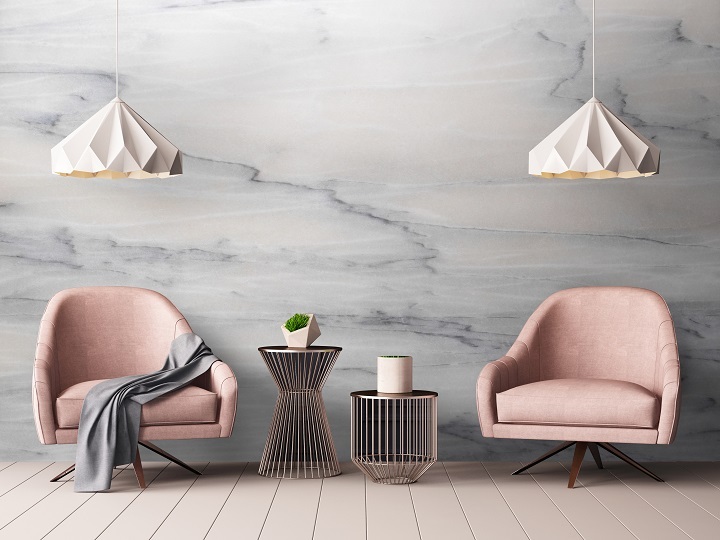 Choosing wallpaper can be a little overwhelming with so many available options, but if you stick to these top tips from Luxe Walls you are guaranteed to create wall coverings that you love looking at. Before you can decide on the perfect wallpaper, you need to consider the style of the room. Is the wallpaper going in a traditional or contemporary space? What is the purpose of the room - a casual or formal living area or a quiet place for rest and relaxation. Are you wanting to create impact with a feature wall, or wallpaper all walls in a room with an overall pattern. The look you want to achieve will be different depending on your answers to the above questions and so too will your wallpaper choices. Formal spaces lend themselves to stripes, traditional florals and damask patterns, where bolder patterns such as geometrics look fabulous in rooms with a contemporary feel. Bedrooms are the perfect place for your personality to shine through, but remember they are the place of rest so stick to calming colours and patterns. With seasonal change upon us, new colour trends are appearing to excite and inspire. 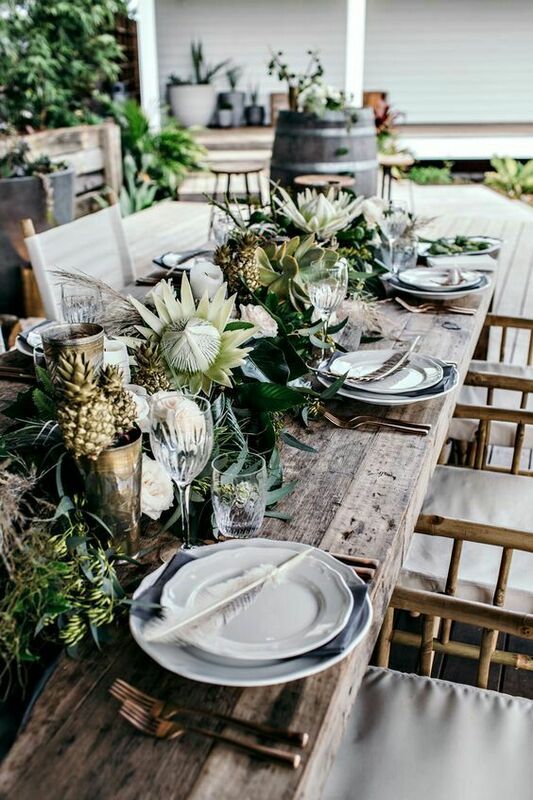 Gone are the bright colours of summer - instead we are being tempted with earthy shades, sage greens, warm neutrals and shades of red and orange. These brighter colours are being mixed with warm neutrals to create shades of terracottas, a new favourite of the season. Grey greens are another key player for Autumn 2018. To create coziness, combine terracottas, rusts and warm neutrals to your grey greens for an autumnal feel. At Luxe Walls, we see many trends come and go, and a couple that are shining at the moment are florals and wood panelling. Florals can change the vibe of the room depending on the colour and size of the blooms and we can modify your pattern size depending on the look you want to achieve. A small delicate pattern works well for wallpapering a complete room and gives a subtle visual to your walls, especially in soft greys . Alternatively, an enlarged floral pattern creates impact and works better as a feature wall. Wood panelling is another on trend wallpaper at the moment, with many requests being received for our Wood Panel wallpaper in a variety of colours. At Luxe Walls, we can customise your artwork choice. We can match any pantone colour, change the size of a pattern and even alter the width of wood panels. Wallpaper is a versatile wall covering option and the perfect way to personalise and create interest to the walls in your home. 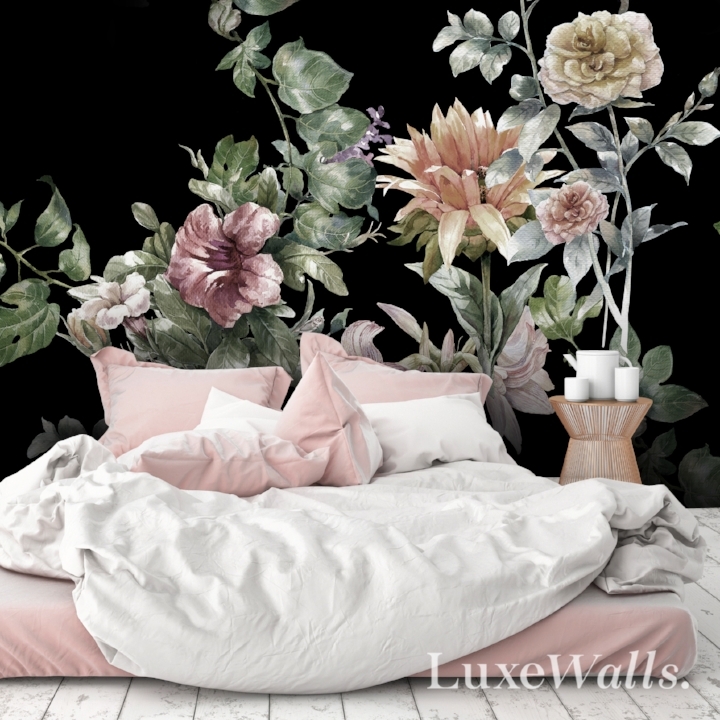 Whether you are choosing to follow seasonal trends, or following your own creativity, with over 100 million images, Luxe Walls has you covered. Christmas is less than two weeks away, yes you heard correctly - less than 2 weeks people! 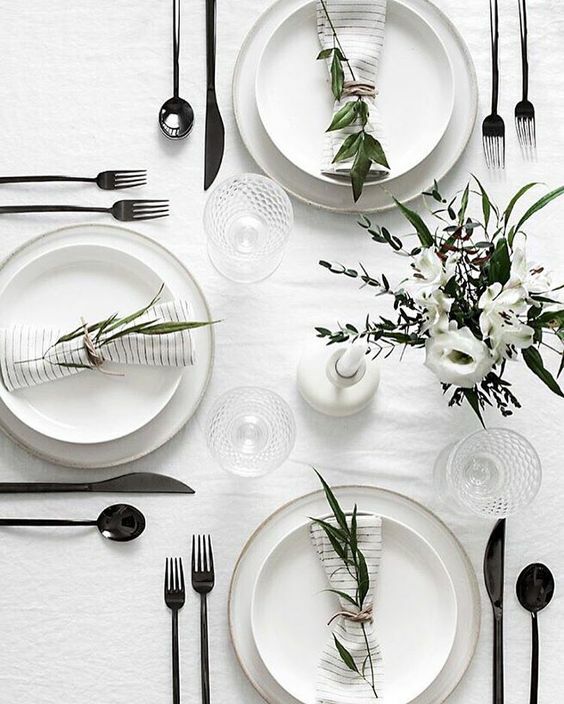 At this point you have most likely decorated your tree, your house, you've hung that wreath and you've started your Christmas Lunch shopping list - so now it's time to start thinking about your table, the centre piece of the whole day and the where you, your family and friends will gather for a long lunch, many wines and lot's of conversation, oh and delicious dessert or two of course! 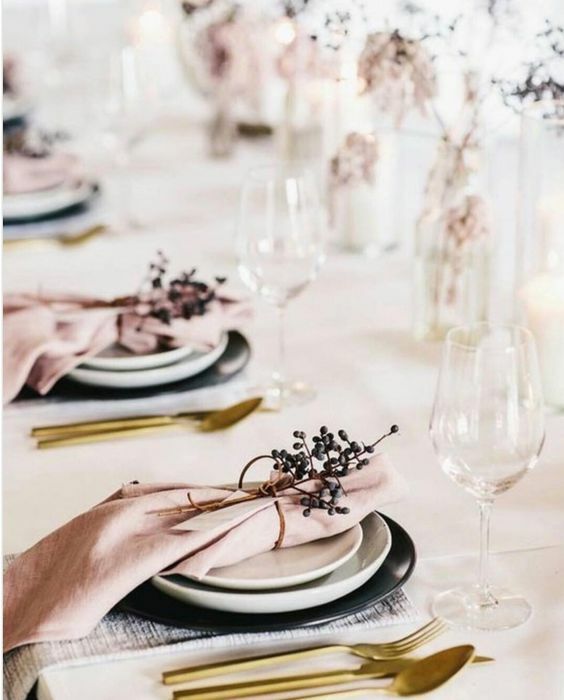 I have compiled my favourite table settings to give some Christmas table styling inspiration - the common theme as you will be able to tell as you start scrolling is 'GREENERY', so try adding some fresh flowers, native greens or foliage to amp up your table and add that extra Christmassy feel! The weather is warming up and the coats are going back in the cupboard - finally the feeling of spring is in the air. 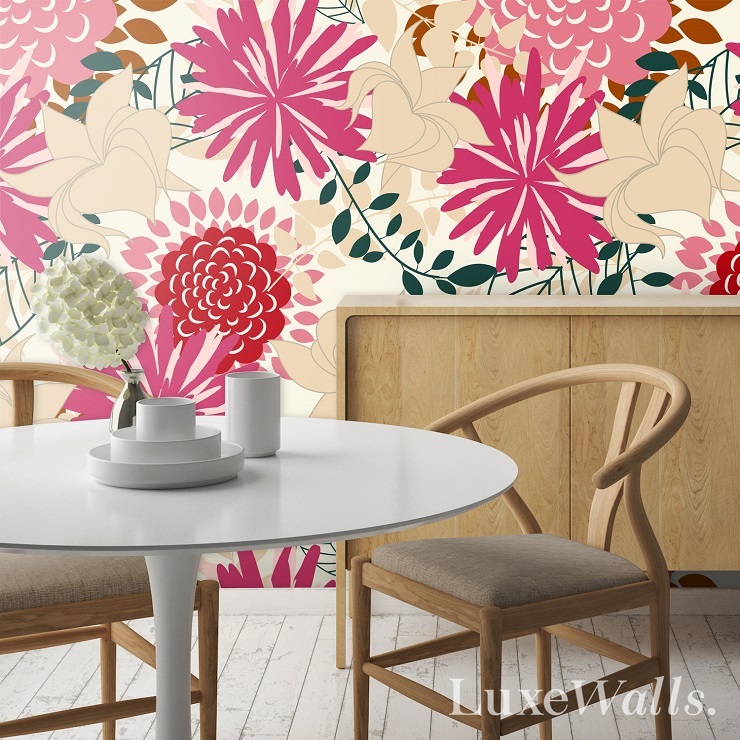 But this seasonal change isn’t just tied to the weather - it's also the perfect time to add some spring love into your home with Luxe Walls removable wall paper... how stunning is the floral print above? Bedroom feature wall anyone? And your wall paper is up, add finishing touches to your space with on trend accessories and tactile soft furnishings to tie your wall coverings in with the rest of your room and add depth to your new look. Follow high street fashion for a bold look and use accessories in a pink/red combination, plants will transform the feel of your room, whilst paying homage to the botanical trends, or keep it soft with a blush throw and geometric cushions. And at $79 per square meter, Luxe Walls wallpaper is an affordable way to add impact. Luxe Walls is the leader in removable, reusable, self-adhesive wallpaper. They offer thousands of high quality images which can be printed on our wallpaper and used to transform your home, business, corporation or event or even upload your own image to give it an extra personal touch. “Another popular trend right now are florals, especially when featured with dark moody backgrounds. These contemporary Renaissance masterpieces will create drama and impact in any room!” says Julia Hill, Director of Luxe Walls. Our office is a space that many of us know to well, whether it’s at home or at work we spend much more time there than many of us would like. 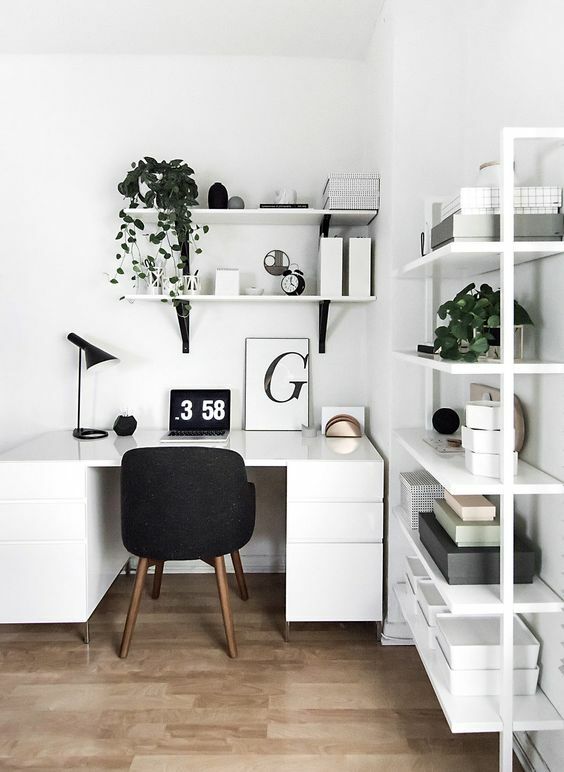 From late nights staring blankly at the computer screen, to early mornings squeezing in last minute tasks – it can almost feel like we live there. Although limiting the time we spend there is not always possible, we can definitely make it a more comfortable space that can be enjoyed (almost as much as a day off). We’ve put together a few simple tips to create not only a stylish office space, but an inspiring and functional one that you actually enjoy – and we've used a few key pieces that will be on display at The Retail Quarter - Reed Gift Fairs modern and exhilarating re-launch of their September fair - check it out here. De-clutter - Get rid of the clutter. Although there may be a thousand of things going on in your head, it doesn’t mean this should be reflected on your desk. Don’t make your office space a dumping ground for mountains of coffee cups and piles of paper work – keep your office clutter free and organised. Storage is key – You’ve probably heard it time and time again, but we can promise that if you get some really great storage for your office space – you will significantly improve your productivity. Organising your tasks into separate folders not only gives everything a home, but also reduces the risk of losing things. For the variety of pens sprawled across your desk, coffee cups make excellent (and stylish) penholders and there are thousands of designs you can choose. Find the perfect lighting - For those lucky enough to have large windows in their home office – why not maximise your use of natural light by keeping the curtains open and letting in the natural light. If you need a bit of privacy, sheer curtains in a lighter colour are the perfect answer. However if the lighting is dull – don’t fret, as the right desk lamp, just like this one from One World Collection, not only provides the lighting you need, but also adds an element of stylish to your home office. Although most of us would rather be outside enjoying the beautiful spring weather than working – why not compromise and bring the outdoors, indoors. Fresh flowers are a great way to brighten up your space, making it fresh and inviting. If you’re a hay fever suffer, why not go for terrarium or hanging pots such as these fabulous ones by Urban Products and All Seasons Homeware to add some lush greenery. The finishing touch – accessories - Candles are the perfect addition to any space, and when it’s the room you’re spending most of your time in of course you want it to smell amazing. With so many options to choose from, why not select a scent that’s going to make feel like your working on the beaches of Tahiti. Endless Candles has created a scent to help you do just that. Not all pinks are made equally and 'Antoinette' from Annie Sloan's range of Chalk Paint is the perfect dusty hue for brightening up your bedroom, kitchen, furniture or walls with a little DIY action! As one of the world’s most respected paint and colour experts, Annie Sloan brings decades of knowledge – and plenty of style – to her hugely popular line of decorative paint, Chalk Paint®. And with books, brushes, stencils, and fabrics, her inspirations are transforming more and more homes every day. I've chosen my favourite pink furniture transformations to inspire you shown below, or for more DIY inspo click here! Brought to you by Nuffnang and Spotlight. Creativity can be incorporated into your everyday life in so many ways… personally I am the most creative when I am designing interiors, styling homes and blogging, however the more you think about it you realise just how much creativity we can fit into our lives each and every day with just a little imagination. You can easily intergrate creative habits into your daily life and the best way to start is to just pick something and do it! And trust me, we can all benefit from seeing the beauty in the world around us more a little bit more. Being Creative and thinking creatively isn’t only for when we are engaging on a craft project or for me when I’m working on a new blog post, it is actually already incorporated into our lives when we are deciding what recipe to cook for dinner, which flowers to buy at the market and what outfit we are wearing each day. Spotlights Craft Month runs online and in store from 1st-31st March and it is the perfect time to start your new found ‘Life of Creativity’… so let’s start making and creating! 1. Get outside into nature – balcony, garden, park, beach, anywhere that has some greenery in it and find inspiration. 2. Get on YouTube and learn how to do something new; knitting, jewellery making, sewing, drawing…and then buy your products and get started. 3. Find an art gallery or museum near you. 4. Go for a walk around your neighbourhood and photograph anything that catches your eye. Now go through them and see if you can find any potential DIY or craft projects. 5. Revamp an old piece of furniture with paint, new fabric or even sanding and re staining it. 6. Make a card for someone and send it with love – try water colours or ink drawing. 7. Keep a little sketchbook and pen you really love on the coffee table for drawing and doodling. 9. Try drawing something with your non dominant hand. 11. Subscribe to a daily email from an online creative business/blog/person for daily inspiration. 13. Brainstorm with a friend for some fun and creative ideas. 14. Pick some flowers and make your own arrangements – be extra creative and repurpose an old jar into a vase and add your own personality to it. 15. Find an object around the house that you don’t need/use and find a way to give it a new life/purpose. 16. Use watercolours and watercolour paper and play with colours and brush strokes. 17. Go to Pinterest and search for DIY crafts and see what inspires you. 18. Create a “inspiration wall” in your house by gathering images, items, quotes, artwork, and anything else that inspires you and put it on a cork board/large piece of cardboard and that way you can keep adding to it. 19. Draw a 1 minute portrait of yourself. My project was turning some gorgeous but plain white ceramic cups and bowls into something a little more interesting and fun! What you will need – all available at your local Spotlight store. - Ceramic table ware of your liking – I used Kitch & Co.
After searching high and low for the perfect TV unit we couldn't find the right piece for our house... I am sure most of you have been in a similar situation and it is so frustrating when you just want to buy it and bring it home and it look fabulous! After deciding that we wanted a black stained oak floating cabinet Matt got to work - he built the carcass and then we ordered the drop down fronts and the top from our cabinet maker, making sure the draw fronts were 1 continuous grain pattern. After renovating a few houses with my partner I understand just how painful painting can sometimes be... it feels like it will never end, you get sore arms and it's hard to know if you have done great or terrible job. Luckily Taubmans are here to help, recently unveiling their Taubmans Transformation Tools. Their clever new digital tools will help all you DIYers with every step of your painting journey, from picking a colour, choosing the best product and preparing, to painting, cleaning up and styling the finished look, YAY... help finally! The Paint Planner is an innovative, industry-first tool that takes the pain out of planning, and provides you with step-by-step plans for your painting project, from start to finish. 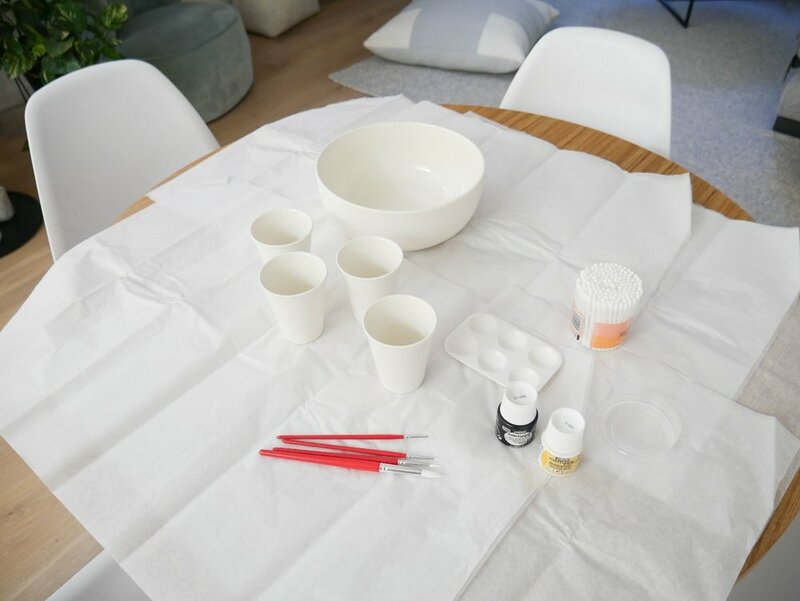 ‘How To’ videos starring Shaynna Blaze – These 12 videos provide all the information, tricks and tips needed at every step of your painting journey, like how to select paint colours, how to prep a room for painting and how to paint. These videos are an amazing tool to have on hand and I promise will make your life so much easier when you pick up that paint brush! Paint Your Own Room Tool is an easy way to visualise your chosen colour in a space by uploading an image of your room and then digitally re-colouring the walls to compare potential options. This tool is a major time saver - no more bringing home swatches and samples and painting patches on your walls, heaven! To celebrate the rising trend of DIY, leading specialty paint brand, White Knight Paints has launched #WhiteKnightRevive - a series of online videos designed to inspire DIYers to tackle their own at-home projects and renovations. The video series includes bathroom and kitchen refreshes, a deck rescue, a chair makeover, concrete porch and Colourbond fence refreshes, a bathtub transformed into a loveseat, a drum turned desk, and a bookcase reimagined as a dollhouse. Follow this step by step guide to rescue your Deck! Sand away any loose wood fibres and give the weathered boards a clean using White Knight Renew It! Deck Cleaner, following the instructions on the label and Leave them to dry thoroughly. “Waiting for the cleaned boards to dry out is the longest part of this easy project,” says Natasha. Secure any loose decking boards, screws or raised nail heads and replace any rotting or severely damaged boards. Then remove any loose splinters. If there are any cracks in the wood deeper than 5mm fill them with an exterior paintable sealant chalk. Apply 2 coats of White Knight Renew It! Wood and Concrete Resurfacer, following label directions. “White Knight Renew It! Wood & Concrete Resurfacer has a thick consistency that rolls on nicely to fill cracks and scratches up to about 5mm deep,” says Natasha. “It is so easy and will completely transform the look of your deck with little effort’. You can choose from hundreds of Taubmans® colours to match the deck to the rest of your house. The colour used for this deck was Taubmans® Fudge Truffle. Finding just the right art piece for a room can be a bit of a challenge, that's why I love to make my own. Sometimes I'll go all out and paint up an original but you know what they say, simple is often best and this one definitely ticks all the boxes - it's quick, super easy and effective. Start with a basic frame, I love these oversized ones from Ikea but you can find great frames all over town now. If you don't like the frame colour, give it a quick hit with spray paint, I like the natural Scandi feel of this one so chose to leave it raw. To make the shapes, I used up some of my card and paper (heaven knows I need to!) These papers are generally used for scrap booking but for a bit of shine, I also love the gold foil card you can find from newsagents. Sketch out your pattern onto the reverse of the paper using a lead pencil. You can be as random or uniform as you like. A neat idea is to trace around a cookie cutter or print out a shape from the net. Either way, do plenty of shapes and mix up your colours. Choose your favourite shades or take inspiration from what's in your room already, that way your art will coordinate perfectly. Use sharp scissors to cut out your shapes, take your time, you want them to look as good as they can. Next take a sheet of card that fits your frame and mount board, I used white because it makes the shapes stand out and goes with everything. Stick the shapes down using a glue stick - much better than messy drippy glues. It's at this stage, you may want to use a ruler to keep your lines straight and your spacing even. Pop the card into the frame, secure the backing board and your art is ready to go. Having my sister Eve home for a few days in Tassie was bliss. While most of our time was spent going out for coffee and wine, sunbaking in the backyard and making oh so pretty smoothie bowls, we did get time for a crafter noon! These printed pillow cases are super easy to make and are all printed by hand, so no silk screen or squeegee required! You can make one today and have it looking pretty on your bed by this evening. Get started now! A set of pillow cases – we used white, but you can choose any colour you like. For best results, use at least 200 thread count. We got ours for half price at Harris Scarfe, only $10 a set! Fabric paint – you can buy fabric paint at any art store or at Spotlight. You can buy a good size container for under $10. It may be called textile printing ink or paint, or something similar. Cardboard, thick paper or newspaper. Whatever you would like to print with- I used a high density foam that came as packaging, it was perfect because it had a smooth surface. You could use balsa wood, smooth cork etc. Eve used a cotton bud to print her dots, or you can use a paintbrush if you would like to draw or write free hand. Wash, dry and iron your pillow cases. To stop the ink going through to the back, place a piece of paper, cardboard or newspaper inside the pillow case. Choose what you will print with… Eve used a cotton bud for tiny dots. I cut some foam into a little triangle. Make sure you use a Stanley knife to ensure smooth edges. For the dots, simply put some fabric paint onto a plate. If you are stamping, you need to put some paint on a sponge, then use a brush to spread it out. Keep doing this while you are stamping, you want to have enough to cover your stamp but not too much! Now you are ready to print! Make sure you do a test on a scrap piece of fabric first. Especially if you are printing with a stamp. 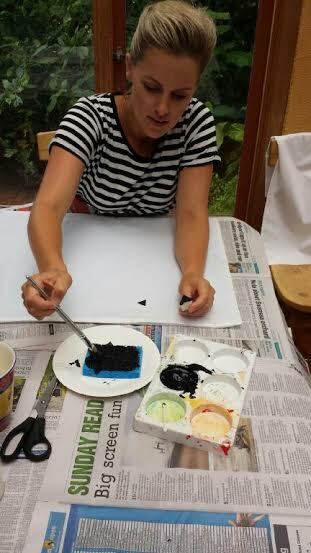 Have a play around with how much paint you need and how much pressure to use when stamping onto fabric. Pillow case time! Eve simply dipped her cotton bud in the paint then pressed straight down onto the pillow case. Re dip into the paint for every dot and use a new cotton bud every 10 dots or so.If you are stamping, make sure to re dip your stamp each time, making sure the paint coverage is even and not too heavy. I like to ever so slightly roll the stamp when pressing it onto the pillow case, just to make sure it prints evenly. Remember, as these are handmade, they will never be perfect, but that is part of the charm! Once you are done, very carefully lay your pillow cases, with the paper still inside, somewhere flat to dry. Once they are dry, iron them, following the instructions on your fabric paint. I place a thin tea towel over the top, then slowly iron over it for a few minutes, on cotton setting. Now your pillow cases are ready to use! Pop them on your bed and feel very proud of yourself! Writing … Mr / Mrs, Good Night / Good Morning, dream big… anything you like!